The following is the foundation of beliefs on which Island Christian Academy is based. They are also the key elements of Christianity that will be taught in various ways through all grade levels. 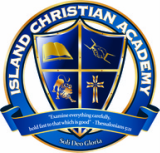 The substance of these statements is that which will be considered primary doctrine in Island Christian Academy. Secondary or divisive doctrines and issues will not be presented as primary doctrine. When these types of doctrine or issues arise they will be referred back to the family and local churches for final authority. WE BELIEVE that the one, holy, universal Church is the body of Christ and is composed of the communities of Christ’s people. The task of Christ’s people in this world is to be God’s redeemed community, embodying His love by worshipping God with confession, prayer, and praise; by proclaiming the gospel of God’s redemptive love through our Lord Jesus Christ to the ends of the earth by word and deed; by caring for all of God’s creation and actively seeking the good of everyone, especially the poor and needy.